The leaves are starting to turn. There’s a chill in the air. And we instinctively migrate back to our nearest football stadium. Yes, this is the time of year to start thinking about touchdowns, tailgating and tastiness. So here are some unexpected ways to bring your “A” game to your next mobile, pigskin get together. 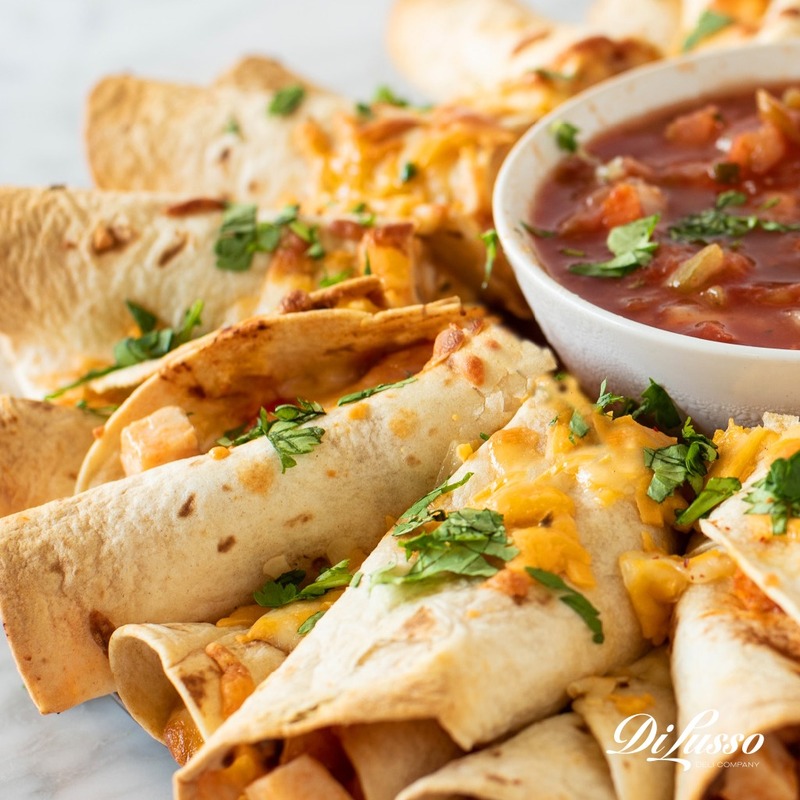 Kick off the fun with this Blooming Quesadilla Ring and show your football family how to pregame in style. 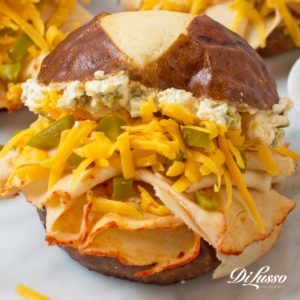 This tasty app is big on flavor and easy to make when you team it up with our smoked buffalo style chicken breast, pepper jack cheese and Wisconsin sharp cheddar. Just add onion, peppers, taco sauce and tortillas and get ready for a blooming good time. The grill is already going. Why not make use of those flames and start everyone out with a grilled appetizer? It’s easy with our Salami-wrapped Baby Potatoes recipe. 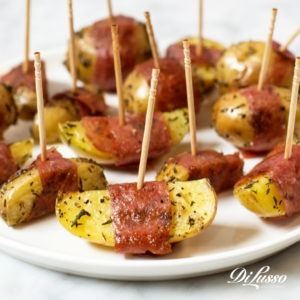 Try wrapping baby potatoes, seasoned with rosemary, with our rich, garlicky hard salami. Put them on a skewer, grill them up and you’ve got something that’ll please any meat-and-potato traditionalist. Speaking of skewers…these handheld delights are easy to make and super convenient to snack on while tossing a few bean bags. 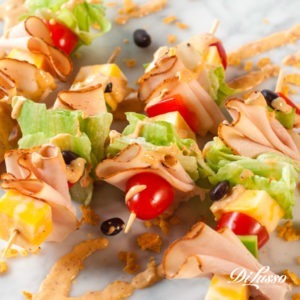 Try something bold and delicious like Southwest Salad Skewer. It’s got just the right kick, with our Cajun style turkey breast and zesty chipotle mustard lime dressing teamed up with fresh veggies and our colby jack cheese cubes. For more ideas, visit our salad skewer blog. Here’s a twist on the favorite buffalo wing that’ll have them doing an end zone dance. It’s the Buffalo Jalapeño Popper Slider. We teamed up some fieriness – our smoked buffalo style chicken breast and minced jalapeños. To balance it out, try adding our sharp cheddar cheese and cream cheese spread. Finally, to make it perfect, it could only go in a pretzel bun. Those AM kickoffs call for something to get the day going. That’s why the Bloody Mary has long been a favorite. But don’t forget, half the fun of these eye-openers are the unique items that accompany them. 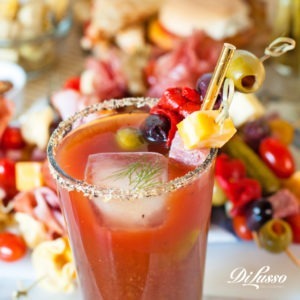 So make sure your Bloody Mary Bar has just the right accessories to go along with the pickles, celery, rim salt and olives – our hard salami, pepper jack, colby jack and sharp cheddar cheeses.